Want to Relax in a Gated Active Adult Retirement Community? Sun Lakes homes with a private pool are in demand as the summer temperatures heat up. And, if you are thinking of buying a home in a gated, active adult retirement community, now is the time. Inventory has been extremely low this year, but homes are still available. Sun Lakes, AZ is an active adult retirement community located in the southeast valley of Phoenix. Bordering Chandler, Arizona, this 55+ community offers homes in five separate communities. Currently, there are only 68 homes for sale out of the nearly 10,000 homes that comprise Sun Lakes. The number of Sun Lakes homes with a pool is only 14 as of this writing. Some choose homes without a private pool and opt for the community pool instead. However, there are some advantages to owning a home with a private pool. Private pools offer a serene and peaceful atmosphere to enjoy even when not taking a dip. Heated pools can be used virtually year round. On a warm summer night, a quick dip in the pool before bedtime is refreshing. Nothing compares to an outdoor backyard BBQ and pool party. 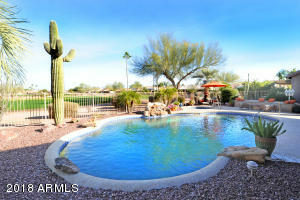 See all Sun Lakes homes with private pool here. Discover a Sun Lakes Realtor who Knows the Area. If you are looking for Sun Lakes homes with a private pool, or any home in the 55+ community, you need a Realtor who knows the area, the floor plans, the real estate trends and the market value. The Kolb Team not only lives in Sun Lakes, Arizona, but we have sold over 80 million in Sun Lakes real estate. We can help you find the perfect home – with or without a pool! For more information about Sun Lakes AZ contact us here or call us at 480-440-0849.